We’d love your help. 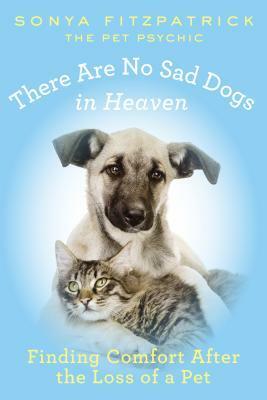 Let us know what’s wrong with this preview of There Are No Sad Dogs in Heaven by Sonya Fitzpatrick. Our pets are part of the family. For many they’re as close as children; for some they may be our only children. And while most of us can expect that our children will outlive us, sadly, our pets almost never do. Losing a pet can be as difficult as losing any other family member; we grieve, we miss them, and, mostly, we want closure, to know that our furry, feathered, or sca Our pets are part of the family. For many they’re as close as children; for some they may be our only children. And while most of us can expect that our children will outlive us, sadly, our pets almost never do. Losing a pet can be as difficult as losing any other family member; we grieve, we miss them, and, mostly, we want closure, to know that our furry, feathered, or scaled friends are okay, wherever they are. To ask other readers questions about There Are No Sad Dogs in Heaven, please sign up. I'm having mixed feelings about this book. Part of me didn't believe half of the things written here. She sounded like a bogus medium that just take advantage of vulnerable griefing pet owners. . But in the same time, what she did say to these pet owners did bring comfort and some peace. Even as I read some of her words, I thoughf of my dying or deceased pets and I cried a bucket. If anything, I am just glad that this book brings comfort to its readers. I didn't know about the author's radio and TV shows, but if I had knew I might have just saved myself from listening to this book. I decided to purchase it seeking comfort after losing our beloved Olive, and it was the first I found about the subject. For people who believe incredible things, this book may help. For me it was just a lot of mambo jambo. The author claimed that she could speak telepathically to animals, which I don't doubt, but she affirmed that they answered. And not only that, she could even communicate with them after death! This, off course, brought solace to the owners, but I wonder who could believe this. I think it's a shame that someone would seek making profit from other people's pain, and for me this is what Fitzpatrick is doing. Despite not being certain if Sonya was a charlatan or not until I had a reading with her myself, I found this book very comforting when I read it only two days after my sweet dog Cash passed away. The stories are repetitive at times but it was an easy, distracting and oddly comforting read when I really needed it. I want to believe the "communications" in this book but there are so many frauds and money grabbers out there to fully believe. I guess, unless you experience something for yourself there will always be doubts. However, reading these stories and how hearing these kind words about their pets living happily in the spirit world heal their broken hearts....how bad can that be? I just have reservations about the exchange of money to hear these healing words. A true life saver during times of loss and grieving. Numerous books describe experiences of human beings who have temporarily died and experienced what all refer to as an “afterlife.” Now Sonya Fitzpatrick, a “pet psychic,” offers comfort to the innumerable pet owners who have experienced the devastating loss of a beloved animal. Whether the reader actually has lost a pet or knows of someone else who has suffered that loss, this is a book of comfort, a book of faith. For it is the author’s premise that there is an afterlife that animals share with Numerous books describe experiences of human beings who have temporarily died and experienced what all refer to as an “afterlife.” Now Sonya Fitzpatrick, a “pet psychic,” offers comfort to the innumerable pet owners who have experienced the devastating loss of a beloved animal. Whether the reader actually has lost a pet or knows of someone else who has suffered that loss, this is a book of comfort, a book of faith. For it is the author’s premise that there is an afterlife that animals share with humans and even animals share with other animals. These animals are capable of conveying their thoughts and emotions in just as real a way as humans are able to do. The author begins with her own experience of losing Ellie, a Rhodesian ridgeback, who was beset with suffering and let her owner know that she was content to “pass over” and be free of pain, adding a reassuring message that she would always be with the author in spirit. After Ellie passed, the author could feel her spirit laying across the writer’s lap and even her other animals made room for her presence next to her owner. Thus begin many tales with a similar message. Some humans seem to have an ability to sense the presence of their pet who has died but remains in spirit and others do not; it is there that this author serves as a psychic who can connect with those animals and bring such relief and peace to these grieving pet owners. It also includes other animals such as cows or cats, etc. It enables owners to let go of guilt if their animal died in an accident. Some owners even realize they may not have conveyed much love to their animal when alive but that these animals sensed or knew that love and want the owner to let go of the remorse they are carrying about not being more expressive or caring. The chapters include communications from animals who had been humans but reincarnated as animals to keep their love and union strong. Or perhaps an accidental poisoning occurred and the animal is seeking to relieve the owner of unnecessary guilt. The stories continue with variety but always with compassionate caring and empathy between owner and pet, between heaven and earth. This book will definitely be a lifeline for so many who have loved, cherished, lost and then re-found communication and love with a beloved animal whose earth life has made the remarkable transition to a heavenly existence. This connection is priceless and cherished by all who share this experience, whether author/psychic or owner. Lovely, comforting read! When I found my way to this book, I was not aware of the author’s radio and television shows, or her beliefs on the Afterlife. I have recently had to say goodbye to my Border Collie, which has been devastating, and have been trying to find ways to find some solace and heal. I found this book to be helpful in that regard. However, it must be pointed out that reincarnation is one of the central themes of the stories presented in this book. If this is not one of the tenets of your faith, as is the c When I found my way to this book, I was not aware of the author’s radio and television shows, or her beliefs on the Afterlife. I have recently had to say goodbye to my Border Collie, which has been devastating, and have been trying to find ways to find some solace and heal. I found this book to be helpful in that regard. However, it must be pointed out that reincarnation is one of the central themes of the stories presented in this book. If this is not one of the tenets of your faith, as is the case for me, you will find it difficult to take the events depicted at face value. This is not to say I think there is any deliberate deception going on here. I believe the author and the people presented in these stories believe the events occurred as described. It also seems the reincarnation depicted in this book could be more accurately described as a form of possession, which leads to some implications I find somewhat disturbing. At its heart though, this is a book of stories about people who deeply love their pets and how they have dealt with the grief of their loss. While I would never wish the heartache of losing a loved one on anybody, it does help to know that there are others who have gone through, and truly understand, the pain you are feeling. In that respect, this book helps provide comfort. I love Sonya Fitzpatrick, she did a personal reading for me when we had our first Sheltie when we lived in the Houston, TX area. That was a long time ago. Our Tyson was around 12 yrs old at the time. She is just unbelievable, I told her nothing on what I was bringing my dog to her. The things she told us he was saying to her was just plain amazing. No way she knew the things that she told us. Anyway our Tyson lived to be almost 15. Our second Sheltie Ozzie had to be put down Oct. 22nd, 2014. He I love Sonya Fitzpatrick, she did a personal reading for me when we had our first Sheltie when we lived in the Houston, TX area. That was a long time ago. Our Tyson was around 12 yrs old at the time. She is just unbelievable, I told her nothing on what I was bringing my dog to her. The things she told us he was saying to her was just plain amazing. No way she knew the things that she told us. Anyway our Tyson lived to be almost 15. Our second Sheltie Ozzie had to be put down Oct. 22nd, 2014. He was almost 12years old. It's been very hard this time as well. I bought this book and it helped me out reading all the different stories from people she had helped. Well I found her on the Internet and did a phone reading with her on our Ozzie a month to the day he passed. This time she spoke with him from the spirit side and the things she told us he was wanting to say to us has helped us tremendously. We laughed and cried. We miss him terribly but he asked if we were getting another puppy cause he wanted to come back to us. As I write this we are waiting to here from his breeder to see if the momma is going to have a litter in the late Spring. In her new book ‘There are no Sad Dogs in Heaven’, famous pet psychic Sonya Fitzpatrick gives messages of hope to pet owners. Fitzpatrick reassures readers that not only do our pets live on in spirit when they die, but they also stay near us. Fitzpatrick shares stories of private readings she’s had with clients who are struggling after the death of a beloved pet. Many owners blame themselves for their pet’s death, many worry that their pets didn’t know how much they were loved. The pet psychic attempts to bring her clients peace and understanding, so they may move on. This is the perfect gift for anyone who has lost a pet. I always learn something from Sonya Fitzpatrick. This is a great book for any pet parent who wonders if their dog hates them, forgives them, or has other lasting negative feelings about them. Sonya is always so positive and supportive. Using many examples, she shows us how forgiving animals are and how we must accept that some things in life are just meant to be and there is little we can do to change it. Sonya also encourages us to be bette This is the perfect gift for anyone who has lost a pet. I bought this book after my beloved dog, Naugy, died at 13. I wanted to be comforted and know that he was okay and that he knew how much I loved him, and this book provided just that. With heart-warming and heart-breaking stories of past clients, Sonya gives readers a glimpse into what their pet thinks about during life and after death. She reassures pet owners that they are not forgotten and are still being loved from heaven. I started this book shortly after my Samantha died. It has taken me several months to get through because I would cry every time. Finally finished and I'm at peace with her passing and believe that this book helped me through a difficult journey. Beautifully written book by my friend Sonya Fitzpatrick. Her love and compassion for all living beings shines through. If you have ever lost anyone that you love, you will find comfort in this amazing book. I love Sonja Fitzpatrick and all her books and this one is no exception. It's a wonderful comfort to pet lovers and fascinating reading. I still miss Animal Planet's pet psychic show, but it helps that Sonja is still writing books.